As mentioned previously, we got this frame to build up as a fun off-road bike. 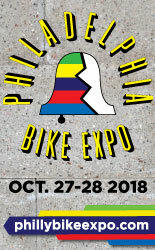 We already had the wheelset, Fat Frank tires, handlebars, saddle, pedals, and some other components, making the remaining build fairly easy and financially feasible. Among the new components we bought were the Velo Orange threadless headset and stem. Though we do not plan to transition to threadless stems, they do make life easier in some respects - such as making it possible to remove the handlebars without redoing the bar tape and lever placement. And as far as threadless stems go, the VO is rather nice looking. The brass bell is mounted on one of the spacers, which mechanic Jim tapped for us when we were picking up the frame from Harris Cyclery. The handlebars are only temporarily yellow - Once we shellac them, they will turn caramel to match the saddle. But the bicycle does look kind of cute with them as they are, like an enormous children's toy. The "maiden voyage" was on Easter Sunday, and the colour scheme was certainly appropriate. 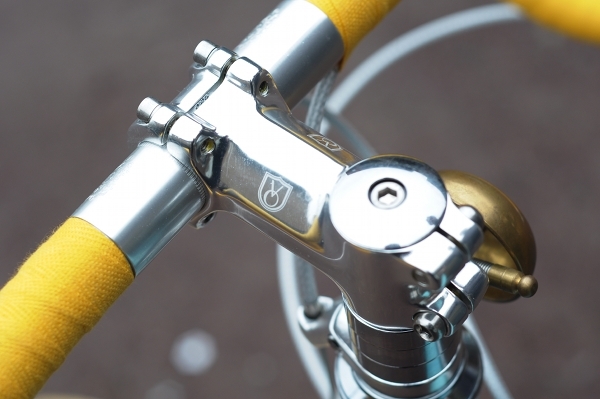 We also bought these Velo Orange Grand Cru MK2 cantilever brakes, which I think are just beautiful. Unfortunately, after riding with them for 27 miles the Co-Habitant is not sure whether he is happy with their functionality. In his opinion they do not perform as well as the Tektro cantilever brakes I have on my Rivendell - so he is not sure what to do. It is not a safety issue, since the VO cantis still outperform the old centerpulls he has been using on his Motobecane for the past two years. But he doesn't want to feel as if he is sacrificing performance for looks or "vintageyness," and he thinks that this may be the case here. Has anybody else tried these? Similarly, he has mixed feelings about the VO metallic braided housing. While beautiful, the brake housing is very stiff and has considerably more friction than the Jagwire we are accustomed to using. I asked about this on bikeforums, and apparently stiffness is a known trait of this particular housing - which is why some avoid it, and others use it only with vintage non-aero brake levers. I wish we had known that before buying and installing the stuff. But now that it's already done, we are trying to determine whether it will perhaps become less stiff over time. Is that a possibility, or just wishful thinking? The final disappointment is with the fenders, or lack thereof. We had initially ordered the 700Cx60mm Berthoud fenders, which, by all accounts and calculations should have been a perfect fit. The first problem was that the fenders arrived damaged: a crushed box, courtesy of UPS. We filed a damage report and will be returning them, with the hope that the seller will be fully reimbursed. But when examining the fenders, it also seemed quite apparent to us that even had they been intact, they would not fit. In fact, we are genuinely wondering whether the set we received was mislabeled, because they simply don't look like they can clear the 50mm tire. Now we are confused as to whether to ask for an exchange, or simply return them and try the SKS. The Co-Habitant does not like SKS fenders - but then he was not too happy with the quality of the Berthouds either (what we could see of it based on the undamaged parts) - so we are sort of at an impasse on this one. These glitches aside, we are extremely pleased with the new Surly Cross Check. It took us only one night to put it together, and in that sense a new frame is much easier to work with than an old one. By contrast, we constantly run into unexpected problems when building up vintage frames, which delays those builds by weeks and sometimes months (this is the case with my give-away touring bike, but more on that later). With the Surly, everything came together as expected, with no installation problems. On its first ride, the Cross Check performed better than the Co-Habitant expected. He anticipated that it would be more comfortable, but slower than his vintage Motobecane roadbike. Instead, it is more comfortable and faster. He does not feel that the frame is too stiff, as some report, which can of course be due to his size and weight. And he definitely does not feel that the bike is in any way sluggish. As his riding partner, I have to agree: He is faster on the Surly than on the Motobecane. Hmm. We are eager to get the brakes and fenders issue resolved, so that he can ride it more - but so far he is impressed. It's funny --- the more bikes you have, or at least have experienced, the more you have to compare the new one to. Personally, I seem to remember all the good things of each and when the new one doesn't measure up to the best of all collectively, it's quick to catch my attention. If only there were a perfect bike. Working out all the details is part of the fun, albeit a headache sometimes. You got yourself a good looker there! I've been looking into a Surly as a replacement for my (now aging) Specialized frame on my commuter; I'm anxious to hear more about how the co-habitant likes his! 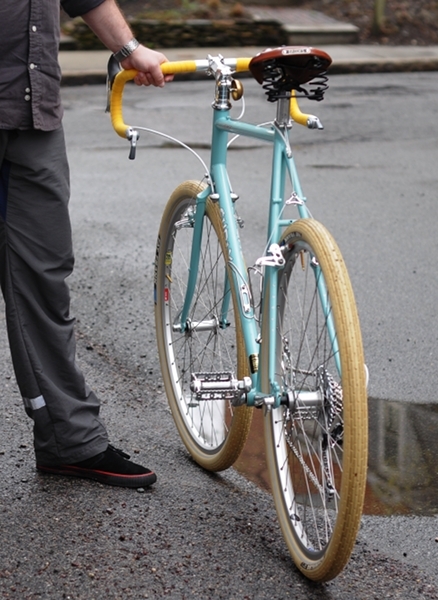 Those Cantis will feel more responsive if the straddle cable is closer to the tire. There is a BQ article that i've read that explains exactly how the straddle cable length affects the brake feel. Acctually, SB has it too. I'm not a fan of the VO braided housing, go with Jagwire (which comes in many colors) or Shimano. Likewise with the brakes, go with Shimano or, if you are feeling crazy, go with the Pauls. As far as the fenders go, were they too narrow ? I love the yellow and blue. Kinda sad it will turn darker. It's s beautiful bike. Sorry about the fenders and brakes. What are his impressions of the brakes, specifically? 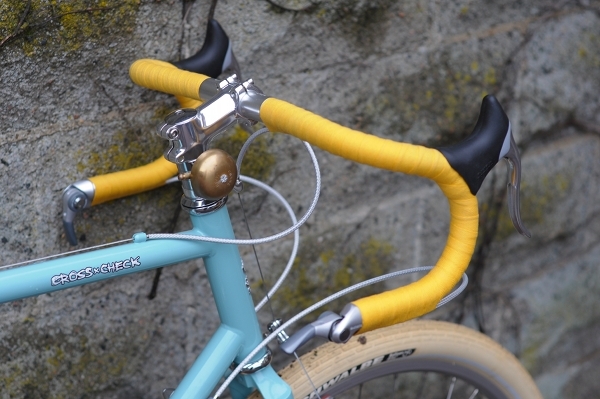 Canti's are so adjustable in lots of ways, I would be optimistic that there are still lots of things to try... I wonder if just shortening the straddle cable would make a big difference. I think the cables themselves are going to be what they are as long as they are...I'd be surprised if use will make them any more supple. What do you think of the Brooks Saddle? I've tried a few with mixed results, my favourite after riding it for a lot of miles is now the Team Pro. How do you get on with a saddle with springs? Seems very retro, I'm intrigued. I had been wondering if you guys were going to leave the bar tape yellow! It does make the bike look cheery, but I'm sure it will look much better once shellacked. I'm going to be giving this tape shellacking a try soon on the drop bars of the old Fuji. Wow! I am very impressed with this bike. The aesthetics are wonderful. I especially like the fatness and whitness of the tires. Most of your build parts are coincidentally what I would also choose. I do hope you can find some nice shiny fenders to fit. I have the same brakes and think they're better than the Tektro brakes I used before. No more squeeling, easy to adjust shoes. The way to adjust the springs so they are equal is to rotate the offending spring in the opposite direction to change the pre-load. And yes, the closer the straddle is to the tire, the more leverage you have. Anon 6:28 - Yes, the Berthoud fenders we received seem to narrow, to the point where we wonder whether they were mislabeled. I have the Tektro cantis on my Rivendell, which are inexpensive and work fine - so those are probably what he will get if he replaces the VO. Newbiker - The saddle is the Flyer, moved from his other bike. He says that with the cushy tires on this bike, the springs are a bit too much, so eventually he will get something else. 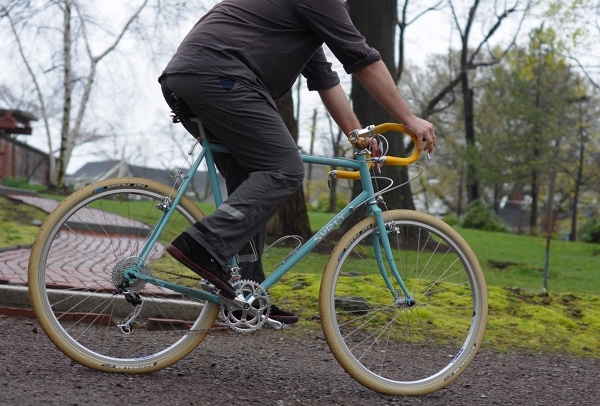 As others have said, that straddle cable on the canti is too long. That brake may be every bit as good as the Tektro CR720, and may be performing badly due to poor adjustment. It would at least be worth a try before spending the money on new. As for the cable housing, I'd replace that now before the tape is shellaced. Sounds like that housing is all form with poor function. I am just about to install VO braided cable housing on one of my bikes, now I'm hesitating to do so. My other bike has Jagwire and I've been quite happy with that, though I can't really compare it to anything else. While I like the look of the yellow tape with this particular shade of blue, I think it will look very handsome once shellacked! This bike looks just awesome with those tires, and I can't wait to see the final results. Straddle cable set-up can be tricky. With low-profile cantilevers, the goal is a 90 degree angle from straddle cable to canti stud. It's difficult to acheive 90 degrees with this type of brake. Shimano makes a super-wide yoke, and that might increase stopping power. Also, are both brakes underwhelming, or just one? 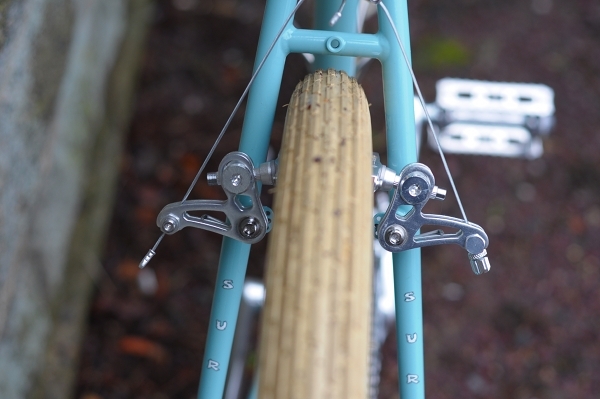 I'm curious about the various canti stud to cable attatchment distance on these types of brakes. Longer = more leverage = increased stopping power... but longer also = less heel/obstacle clearance. There needs to be a chart. Hmm I'll let him reply about the straddle cable. If that's what's doing it, that would be good. I'd call VO, explain what you're running, ask for a troubleshoot. You can't tell if the brakes are the problem if there's a lot of friction in the housing. If, when you were threading the wire into the inner sleeve initially there was ample resistance then it's pretty much going to remain that way. Either the cable is too thick or the inner sleeve diameter is too small. Some of the bends you're running exacerbate the problem. Disconnecting the main cable from the anchor bolt, pulling it, then running lube via capillary action should free things up a little, but I doubt it will make a big dif. Once the housing/cable thing is solved as pointed out cantis required fiddling for power and modulation via the straddle cable. Keep in mind also the pads and rims are new and may need to be scrubbed in with more use. VO stuff can be very good but in their rush to get so many new products to market they aren't tested sufficiently sometimes. The customer is the one who does it. I have Franks; they make any frame comfy. Judging from the pictures and MDI's concerns about brake performance, it appears that the cantis have been set up with too little mechanical advantage. It looks like it might be remedied with some cable adjustments alone, without tinkering with the pads- sounds like those are dialed in from his description elsewhere. First, lower the yoke so the bottom is positioned just above the holes in each of the fork crown and brake bridge. Next, back off the barrel adjuster on the straddle cable such that the threads are flush with the nut. Then, while squeezing the pads against the rim, manually, remove all the slack from the straddle wire (an extra set of hands helps with this...). Lastly, tighten the barrel adjuster until the pads have a couple mm clearance from the rim. If this doesn't do it, then the pads will need to be repositioned as well. "VO stuff can be very good but in their rush to get so many new products to market they aren't tested sufficiently sometimes. The customer is the one who does it." The same can be said of Rivendell though. We buy loads of stuff from VO and Riv both, and are happy with their products most of the time. Will have a look at the brake set-up again once we get home. I've had good success tuning canti's and think that just about any quality set can be made pretty awesome. Don't forget that the levers themselves contribute to a greater or lesser degree to ultimate brake feel as well. Sometimes there is a little trickery that can be applied to them too. SKS fenders can look nice and are (as I was told at the bike shop) much easier to install than metal ones. I just installed them in my recently aquired Fuji Touring bike. However, the presence of the rear rack made things a little bit hard and a couple of supports had to be bent around it leaving the whole assembly under some stress. Without the rear rack there should be no problems to install them and they seem to have enough clearance for those big tires. I kind of like the bar tape yellow. It gives it a playful look. But I'm also sure it will look classy once you put the shellac on it. Strange-- everyone is hating on the VO stainless braided housing, but I have it on a bike with old-school Shimano Cantis and I think the housing is fantastic! Stiff, yes, but a very direct feel... no sponginess. And I don't feel any friction, either. I think it's too easy to blame one component of a system before analyzing the way the sum of the parts work together. i.e., there could be something else causing the friction (like cable that's the wrong diameter). And agreed with everyone-- straddle wire has to be lower. That said, I'm not a fan of VO's brake pads, neither the black nor the imitation-koolstop salmon versions. They just don't stop as well as Koolstops. Oh, and I have very expensive Jagwire housing on all my other bikes-- I don't like it nearly as much as the VO braided cable. The Jagwire derailleur housing is fine, but the brake housing causes a spongy feeling in the brakes, which is always worse on the rear brake-- probably caused by compression of the housing as cable tension is applied. Someone on a different forum mentioned that VO brake inner cable may be slightly thinner than Shimano brake cable, or perhaps Shimano brake cable is thicker than standard. Either way, I may switch to VO cabling and see if it improves things. Re: friction. It increases particularly in places where the housing bends. There is very little friction in straight runs, but introduce curves and the friction becomes worse than Jagwire. As far as stiffness, what I meant to say is that it will get settled into the shape I need and stop exerting as much pressure on the inner cable, not become generally more supple. Re: fenders. No they are not too narrow for the 50mm Fat Franks. That's mis-phrased. The fender's curve doesn't perfectly match the 700c wheen equipped with a Fat Frank, so it will need to be gently straightened out along the entire run of the fenders. They are also shallow and will need to be pinched in at the same time to clear the brake bridge and hug the curve of the Fat Franks better. 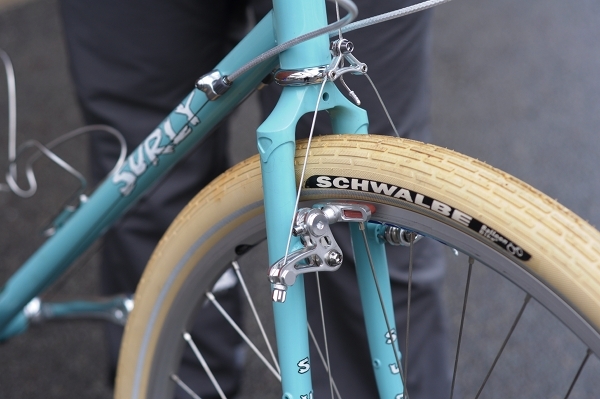 But all of that is par for the course, some bike people think you have to massage these fenders into shape, etc. I agree, to an extent and am currently considering getting wrong-size fenders and modifying. re: fender quality: I've seen VO fenders that look like a ton more care went into fabricating them, not to mention Honjos. 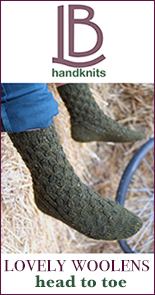 I couldn't believe these carry the Berthoud name. re: straddle cable length. I could lower the rear straddle some, but there is very little room for lowering the front. It has to clear the fender and I don't want to obscure the fork crown bolt. Rear brake bridge is kind of too low (imho) on this bike, and I am not planning to use it for anything except fenders, so the straddle can come down here a bit. re: brake strength. I've adjusted other cantis so I am aware of the general concepts and even read the pseudo-scientific article by Circle A guys (it's kind of awesome, btw and so is their toy) as well as Sheldon's advice, etc. My opinion is that these are weak taking all these factors into account. I'll probably wait before changing pads, lowering straddles, etc. It's not a huge problem, but they pale in comparison with even cheap V-brakes. So much power there. I don't think any adjustment change to these would get me there. re: feel. This bike is amazing. Nothing like it. I am sure it's mostly due to the Fat Franks (and we'll have a full review soon), but it accelerates wildly, forgives even the most unpleasant terrain (potholes, curbs, whatever) and feels snappy and zippy. MDI, cantis will never feel as powerful as V-brakes. Sounds like the cross check is a really nice all-rounder type of bike. Looking forward to seeing and trying it in person. The general rule is run Shimano cables w/Shimano housing, Campy w/Campy. Jagwire is a generic that doesn't work well at all w/Campy Ultra shifters, decently w/some Shimano stuff. I assumed you were running VO cables with the housing. A thinner wire should do the trick. BTW cables are supposed to be stiff to allow for proper cable movement and positive feel. The problem is when you attach super stiff cables to ergo levers. Of course the aim is to get a fairly straight run, but ergos necessitate a Right Turn Now shape. One way to do it is not to wrap the housing in the final turns of tape. It looks like the Nitto "asks" for taping all the way to the shim; many modern road bars have the bulge go farther along the tops so the taping stops earlier, the bend less extreme. High performance housing doesn't look great, but works great. Still there are little tricks to get it to work better. re: V brakes. Yup and yup. Cantis work decently if adjusted well, and some will say can approach the power of Vs. Not in my experience. Outright stopping power is not comparable. What you get with cantis is modulation and mud clearance. As rider/load weight increase modulation becomes The Inability To Stop. For your size and potential off road use I wouldn't even think of cantis. Again, ugly works. Someone spent a lot of time and effort on the Circle A calculator but it reminds me of the Shimano IGH graph. Instead of, "what are the y values" the calculator begs the question, "how do these compare w/Vs, discs w/this size rotor, discs w/that, discs and Vs with these pads, etc." You ride with the amount of braking power you have in mind. If I wanted to pucker down a steep rock-filled descent I'd surely pick the brakes at the bottom of this chart. Dude, you should write these tech journal entries. All of us mean well, but it's hard to troubleshoot with incomplete info. Re: fast and zippy. Welcome to the arms race. MDI - I am confused why you're comparing these to V-brakes, but I guess you are speaking generally. Personally, I dislike V-brakes because they are too strong for me, and I find them difficult to modulate. My Tektro cantis are just right though. Wish I could try the VOs on your bike; they are so beautiful. Berthoud stainless fenders are measured to the outside. The metal is rolled to the inside to eliminate the sharp edge, make the fender stiffer, and increase the life of the fender before it finally cracks and needs to be replaced. This makes the inside width of the fender about 9mm narrower than the stated width. I would want at least 5mm clearance on each side of the fender when the fender wraps down around the sides of the tire. So, with the stainless berthoud fenders, you should always use a fender that is a minimum of about 18mm wider than the width of your tire,measured at the outside of the fender, depending on how much vertical clearance you have over the tire in your frame. So, a 60mm fender may be intended for a 42mm tire? Merlin: there are people who have used the 50mm Berthouds with 42mm tires to good success, so I wonder if Peter White's recommendation is overly conservative? No, the 60mm fender fits the 50mm fat frank fine. The difficulty (and source of misunderstanding) is the circumferential fit--they don't look like they're fot 700c with really large tyres, but maybe it's something Berthouds expects you to bend into shape. MDI-- thanks for the link to that canti geometry calculator! Looks like it could be fun. The one thing I notice when looking at your setup is that the canti arm angle (the 'alpha' parameter in the calculator) is quite large, and when plugged into the calculator, appears to provide the least amount of mechanical advantage. I am still wondering about bottom bracket height with the Fat Franks? The side view photo even makes it look very high. Maybe the tall rider's long legs make for a comfortable reach to the ground when coming to a stop. I have found the ground an uncomfortably longer reach when fitting 35mm Paselas in place of 30mms on my mid-'80 Gitane tourer. 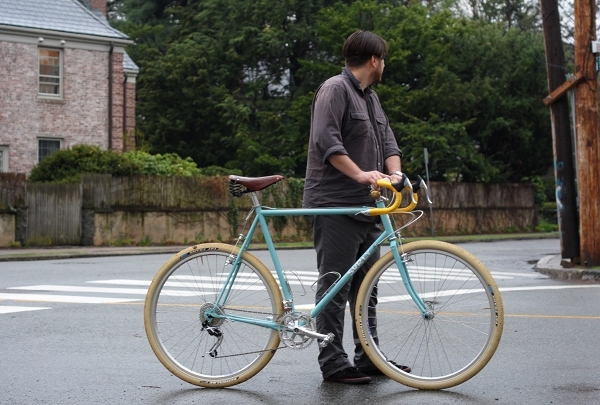 This discussion is kind of making me want to put fat franks on my tiny mixte. Looks like a great bike to me. I like the colors as they are buit after the yellow tape is shellacked it might look even better!! Hey Jim, I saw your bike this weekend at New Amsterdam! It looks awesome. Even better in person. Congratulations. Argh, wish I could have gone to the New Am show! This may or may not help, but... we have the 60mm Berthoud fenders in the 26" size on the other half's mountain bike. He's running 47mm tires, and based on the measuring tape, I'd say there's between 5-6mm on each side of the tire. But then, he's also installed the fender 20 full mm off the tire surface for mud and stick clearance, so he made various custom wood and aluminum mounts to achieve this. There was quite a lot of swearing during the installation process, but it really looks great now, and the fenders are tough as nails. Only 52mm? That sounds risky. When you "open them up" to fit the Fat Franks concentrically, the fender diameter will decrease slightly... so they may become more like 50mm. I meant width, not diameter. Thanks very much neighbourtease!! I'm excited about getting it. Should not be long now. Build looks nice so far. FWIW, there's a guy who works at trophy who runs franks on his CC and he says that they will rub laterally if the wheels go even slightly out of true. Just something to think about. Re: canti set-up. Everyone gave some good advice, but one thing that wasn't mentioned that may be helpful would be to try to move the ads as close to the brake-arms as possible, then re-adjust the cable tension to get the pads back close to the rime. Shimano brakes use different spaced washers for this, but it looks like your grand cru cantis have the old-style posts, which you should be able to loosen, move outboard, and re-tighten. The plan to re-tune and swap plans before replacing the whole brakes is a good one; while I suspect that VO stuff tends to be all-show-no-go, I believe you will be able to dial them in with time. I still think it's amusing that the bike keeps being described as a "fun offroad bike". With the current rubber, coupled with MDI's professed disinterest in actual offroad riding, i suspect it'll see very little time offroad. A shame, b/c the CC is totally capable. Reminds me of when yuppies drove jeep wranglers in the 90s. Replicating my brake setup on Circle A calculator confirmed that moving straddles all the way down so that they touch the rubber would change my mechanical advantage from where it is now to very slightly better. If I look at low-profile cantis, the mech advantage for a similar setup is more like 4 or 5. Much more powerful, but admittedly also much less pretty. Oh well. Oh, and rob--thanks for your opinion re: jeeps and my offroad cycling. It's a marginally theoretical improvement in the front, where most of the stopping power is. Improvement in stopping power in the rear will get you an increased skidding ability, but not stopping. Aside from looks, what's wrong with Vs for this bike? Never mind, brain fart. Different pull ratio w/ergos. Remember what the Circle A guys said: "Additionally, it is important to realize that performance of brakes is dependent on more then just theoretical mechanical advantage. Losses due to cable friction and flex in the system, whether in the brakes or levers, or due to poorly installed housing, can have a significant impact on your brake's performance." Screech sure lives up to his name. I was going to claim it but found out he beat me to it. You slap a set of cross tires on this and watch the hillbillies scatter. On a side note, does anyone have an explanation for why V-brakes generally cost about 1/2 what decent cantis cost? Honestly, a complete set of decent Deore V-brakes costs about $40, compared to $80 cantis from VO or Tektro. Tektro V-brakes can be had for half again the price of Deores. It doesn't make sense, unless it's simply a matter of scale economics? anytime, MDI. your concerns re: mud clearance are puzzling, though, given that you intend to install full fenders and avoid trails. i hope you haven't taken offense to any of this. GRJ, i think the main problem with running V's is that he'd need the long-pull dropbar levers. I've never used such levers, but tektro makes em and dia-compe used to make them. Some folks report that they feel "yucky", but i cannot confirm that. Personally, i think the CC would be nice with some northroads and mtb-levers controlling some V-brakes. The XT v-brakes on my LHT are incredibly good, and the finish matches my tubus racks very nicely. But, i believe that those brakes can/will be sorted. MDI- shortening the straddle cable up front a little won't hurt, so long as you take care to keep it from interfering with the fender; some measurements taken beforehand should help avoid that. It really does make a huge difference, as does moving the pads in relation to the brake-arms. Some kool-stops would help too, although i suspect that leverage is the issue you're primarily grappling with currently. GRJ--just looks. From what little I've tried Vs are awesome for actually, you know, stopping. But so not easy on the eyes. Also, low-profile cantis stop so nice according to this calculator. I mean--my goodness--twice the mech advantage for same straddle arrangement compared to these Mafac-style cantis. The mid-profile are somewhere in between, I guess. It's hilarious that my wide-profile canti brakes "on paper" are worse if you follow the graph than even centerpulls. Someone said Fat Franks can rub the CC stays if slightly out of true. I guess it's possible. I just looked, and it appears I have more clearance there than on my Motobecane with 32s and certainly more than today's road bikes if you put 28s on them. I think it looks scary compared to proper mountain bikes, but in practice, especially if you use skinny rims is totally fine. Wide MTB rims may cause Fat Franks to flair out a bit and--who knows--perhaps be more prone to rub. If I lower the front yoke at all, the bottom of it will obscure the exit of the fork crown bolt. There is nothing there now, but who knows, in the future maybe front rack or fork crown light mount? So, I would do it if it pushed my mech advantage from 2 to 2.5, but I am unwilling to do it for like 5-10% increase. SV - sshhh don't tell anyone. Avid Vs can be had for the price of a fancy sandwich and a beer. Screech - good point. Didn't know about the drop linear pulls. MDI - The VOs are hot, for sure. I know nothing about low profiles, but know enough to see what the pros are running in cyclocross. Evidently they like them. A guy named Lars Boom ran them in Paris Roubaix. I'm thinking whatever a guy runs with that name it's good. Not to Hijack the thread but here is a picture of my Surly, Norm, my everyday ride. The Cross Check is a great bike. 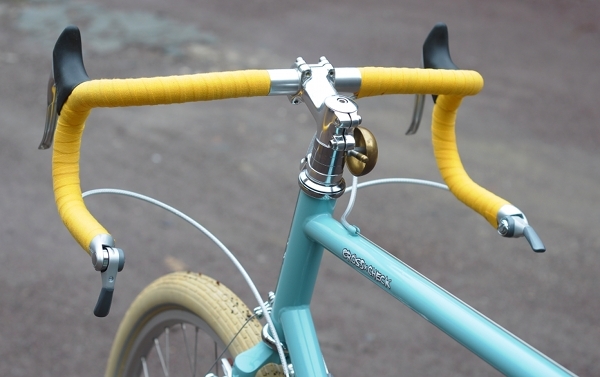 I use the IRD cantilever brakes which I really like. I actually think that V-brakes would look appropriate on this bike. It's supposed to be rugged; not some prettyboy. 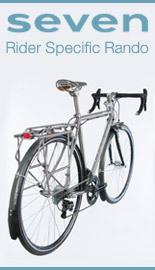 Bike Hermit - Thanks, I did not know IRD made cantilever brakes; will have a look at them. What year is your Cross-Check? That colour is beautiful! It looks like a 2008 Misty Mountain Gray - that's the color I wanted. If you want to use V-brakes with the levers you have, all you need is to install a compensating device like a "Travel Agent", they are a little fiddley to set-up the first time but really do solve the problem of differing ratios between V-brakes and regular road levers. I haven't seen any new ones for sale for a while but there are a bunch floating around from the period when V-brakes(Linear Pull actually) were brand new and everyone wanted to upgrade without replacing whatever generation of XTR integrated shifter/brake levers they had on their mountain bikes. 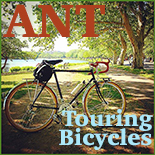 Folks are still building touring bikes and tandems with Vs and "Brifters"(Ugh, that word) so there must be something available. I'll trade you 2 nice used travel agents for your Lovely brand new "all show and no go" VO cantis. Don't think about it, just agree and send them to me...Quickly. I had a set of Empella Frogglegs - also based upon the Mafac cantis that your VO brakes are modelled on and I found their performance disappointing. 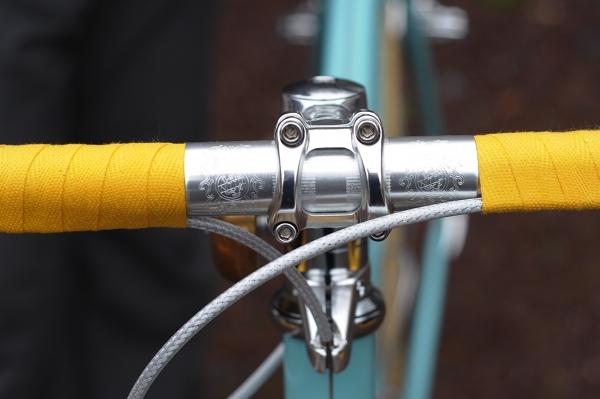 The straddle cable and centering arrangement was really fussy and the brakes lacked any way of adjusting the height and toe-in of the brake shoes. Whilst they looked wonderfully vintage, I quickly wished that I'd opted for the Tektro CR720s, which have that vintage wide angle look, but with v-brake block compatibility and ease of adjustment. 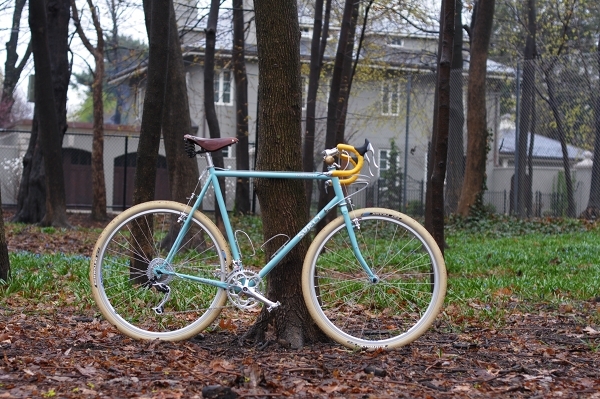 I have the same frame (same color, even) and am considering a similar build. I'm currently looking for a stout wheelset that will accept wider tires like the Fat Franks. What make/model are the wheels on this build?